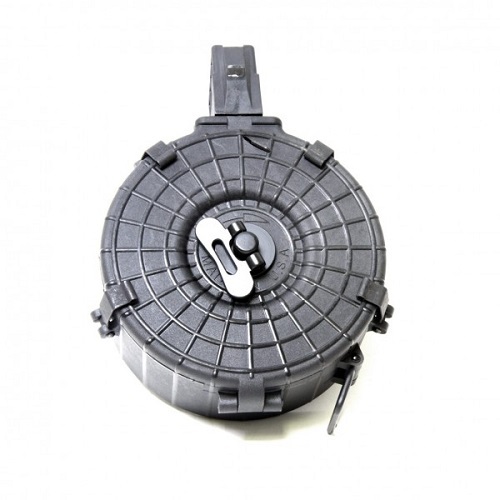 This drum magazine holds 73-rds of 7.62x39mm ammunition providing serious firepower for your AK-47, MAK 90, and many other 7.62x39mm AK variants. Constructed of a high impact Dupont® Zytel ™ based polymer with an over molded steel feed lip insert for added strength. Integral tensioner allows magazine to be stored loaded for extended periods while ensuring maximum reliability. CA - 10 Rds, CO - 15 Rds, CT - 10 Rds, DC - 10 Rds, HI - 10 Rds, IL (Oak Park 10 Rds, Chicago 12 Rds, Aurora 15 Rds, Franklin Park 16 Rds), MA - 10 Rds, MD - 10 Rds, NY - 10 Rds, NJ - 15 Rds. CA, CO, CT, DC, HI, IL (Oak Park, Chicago, Aurora, Franklin Park), MA, MD, NJ, or NY.